All forklift trucks are required by law to ensure that it holds a report of thorough inspection. This applies to trucks on hire also. Failure to comply could invalidate your insurance, leaving you open to prosecution or much worse, a serious accident or injury due to faulty equipment. 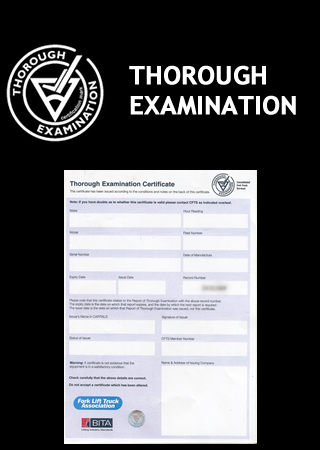 Thorough examination is like an MOT. It must be carried out once a year, and is substancially different from a service or maintenance inspection. The thorough inspection will give you 'peace of mind' and a safe working truck. By choosing Norlift, you are complying within the law and with the knowledge your thorough inspections will be carried out to the highest possible standards at all times. Call us to talk through all the details of a thorough examination and find out much more. Contact Norlift Limited for much more about all of our forklift driver training services and thorough examinations.